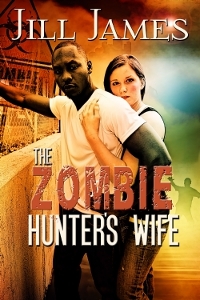 Is marriage an antiquated relic in the zombie apocalypse? Or is marriage whatever you decide it is? Michelle Greggs is forced to kill her undead husband and vows to never give her heart or her safety and security to another. She huddles behind cement walls and wishes for a return to the normal world. Teddy Ridgewood seems like an overgrown kid with his thrill of zombie hunting, but his happy-go-lucky attitude hides a wounded warrior facing the idea that zombies were once human beings. As Michelle discovers a side of Teddy that he doesn’t often reveal she feels yearnings to know him better. As they give into their mutual feelings, a twisted preacher sets up camp nearby and turns his lust on Michelle. Can Teddy help Michelle discover her true strength before the toxic church destroys what little they have reclaimed from the zombie apocalypse? Anger and fear warred within her as her husband walked up the hill to their home. Even if he hadn’t still been in his dark blue SFPD uniform Michelle Greggs would recognize Mitch anywhere. The half of his face she could see retained the stunning good looks she’d fallen for all those years ago when they were in high school, when he’d been captain of the football team and she’d been the nerdy girl who beat out the head cheerleader to win his heart. He turned slightly and the other half of his face was in ruins, his eyeball pulled from the socket, hung by a tendon, and rested on his bloody and torn cheek. Black goo oozed from his mouth and ran down his police uniform shirt to mix with the blood dripping from his chin. The shirt she’d ironed with loving care last night was encrusted with gore. The pants with their knife-sharp pleats were torn and bloody. Her breath caught on a wheezing gasp. His head turned and one blue eye tracked her as she skittered backward, trying to find the doorknob. From two houses away he’d heard her small inhalation of breath. From two houses away she heard his ravenous moan. She bit her lip and stifled her scream. The thing that had been her soul mate shambled closer, tripping over the crack in the sidewalk, the one he kept telling her he would fix, and now he never would.